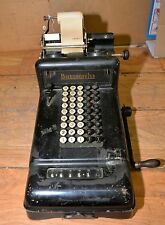 Burroughs Adding Machine 10 Row 1910 Works Excellent. I added pictures of serial number, from my research I believe it to be a 1910 model. It is in overall excellent shape, all buttons work and it still prints. any questions please ask Shipped with USPS Priority Mail. Less common 6 column machine. Missing one ribbon cover small dent on side. would need maintenance to be used. 1934 Burroughs Class 5 Adding Machine. Serial Number 5-459188. Great Piece ! It is marked: Burroughs. All pricing is up front so you know exactly how much everything is! Because of this, they are sold AS IS, as found. WE WILL NOT! Nice Antique Condition | Serial Number A383218. From a recent local estate sale, an antique 1920s Burroughs adding machine. Arm works, numbers appear on roll, but they do not advance, though I might just have the paper fed in incorrectly. Vintage BURROUGHS C 3200 Adding Machine 1970's RARE! Nixie Tube Free Shipping! (Rare and hard to find! Powers up and all the Nixie tubes light up. Photos do a nice job of showing condition.). Tested for Key Functions, R2/Ready for Resale. 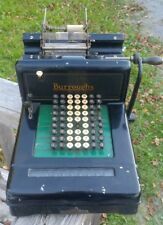 Rare Antique Burroughs Adding Machine Class 1 Model (or Style 3). This machine was built by The American Arithmometer Company. This machine was built at the Burroughs main plant in St. Louis between 1900 and 1903. Based on the serial number this machine was built in 1900. Burroughs moved the operations to Detroit was. 1903. The machine was called The Burroughs Registering Accountant Style 3. The keyboard looks good Anna the precious decals are in good shape. This machine comes with a key and has its own stand that is in good shape and would have to be shipped separate. In 1904 the company changed their location and the name to Burroughs Adding Machine Company. Please view pictures carefully. Sold as in untested. Manual or Electric Operation. Side handle is detachable for electric operation. 3-654897 Class 3 adding machine It was made at the Burroughs main plant in Detroit, MI in 1920. As a collector, you may have specifics that you are looking for that I may have overlooked. We decided to give away our net proceeds to local charities. 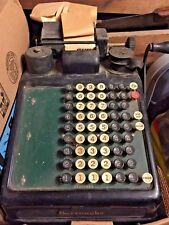 1920's Burroughs Portable Adding Machine - All Original. Shipped with USPS First Class Package (2 to 3 business days). 1920's Burroughs 6 Column Adding Machine Serial number 8A50731. All keys function fine (except one is missing a button) Ribbon needs replacing. Needs a good cleaning Please see photos for other conditions. This is a must have for the adding machine collector or for anyone who wants to have a nice Conversation Piece. If there are any questions or concerns please feel free to ask. I can provide extra photos if needed and answer any questions if I can. Burroughs. Adding Machine. free local pickup. The machine is missing 1 button which can be seen in the pictures provided. sold as is. THIS IS SO COOL. THIS EARLY BURROUGHS ELECTRIC ADDING MACHINE IS IN VERY CLEAN AND MOST EVERYTHING WORKS with one exception. The REPEAT KEY will not always pop out when you hit SUBTOTAL OR TOTAL. We also deal in 78rpm records & machines. STORAGE: RM-107B. SKU: SB-118914. ITEM ID: 118914. Includes the original paper insert on the left side of the machine. Our number one priority is to treat you right. That's our promise to you. Unique adding machine from circa 1930s 1940s. . Antique BURROUGHS Adding Machine mid-century Made in America works! Burroughs mid-century adding machine in working condition. Tested to type and arm works, sold in good faith. Antique Burroughs 10 Column Electric Adding Machine. Many are primitive just because of having survived so long amongst us. Normal Wear From Use And Age. I hope you do also. I've worked in sales all my life, and have never felt that only money makes the sale. Serial number C35144S. This machine powers on and runs when it’s plugged into electricity. Buttons are stuck. A great project or conversation piece! 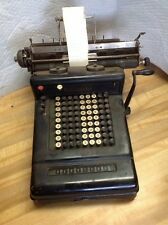 Vintage Antique Burroughs Series P 10-Column Electric Adding Machine. Up for sale is a beautiful, old adding machine and stand. It would be a fantastic display piece in a bank or accountants office! Incredible machinery. Believe to be made around 1911. Serial #6-612302 Made in Detroit. From research I have done many of these units are in museums. I cannot find identical model with motor. Most are manually operated. BURROUGHS STYLE NO.4 ADDING MACHINE WITH ORIGINAL CAST IRON STAND. -THE PORTION OF THE STAND THAT MACHINE SITS ON SPINS FREELY. SPINNING IT WILL RAISE AND LOWER THE HEIGHT. ONCE HEIGHT IS SELECTED THERE IS A BOLT YOU CAN TIGHTEN TO KEEP IT IN PLACE. I do not know the model number or much about this. Beveled glass on 3 sides is in very good condition. One non number key cover is missing. Considering the age - it is in pretty good shape. See the pictures. The machine is missing one top depressor at the lower right corner- it still functions with the top piece. The adding machine has been tested- it does power up and appears to work fine. The adding machine may be used or put on display- it is a nice conversation piece! Antique 1900s Burroughs Adding Machine sold as is! We pride ourselves in trying to locate and bring to market The most rare and unique pieces we can find. LOCAL PICKUP ONLY. OPELIKA, AL 36801. 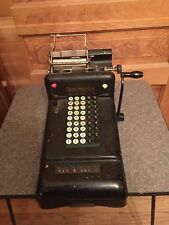 Antique Burroughs Hand Crank, Nine Column Adding Machine. It is untested with normal wear. I don't know how to test it. It is in very nice physical shape. It even has a partially used roll of paper installed on it. Free local pickup is also available in the Cherry Hill/Voorhees section of Southern NJ. Pretty dusty from storage, it is just as I found it. It appears to work properly. It powers up, the keys move and hit the printing ribbon, but there is no ink on the ribbon. The paper advance works. SERIAL NUMBER 3-872259. MANUFACTURED IN 1923 I BELIEVE. -MISSING ONE BUTTON. HANDLE ON HAND CRANK IS BROKEN OFF. RUBBER FEET ARE MOSTLY WORN OFF. PLATEN HAS WEAR AND INDENTATIONS. GENERAL WEAR--SCRATCHES AND SCUFFS. On the back its labeled with 5-1283287. See pictures for condition, would make a great addition to your collection. Ink ribbon is old but machine prints in red and black. missing button on right corner. missing one hand tighten screw on back. missing one rubber foot on bottom.